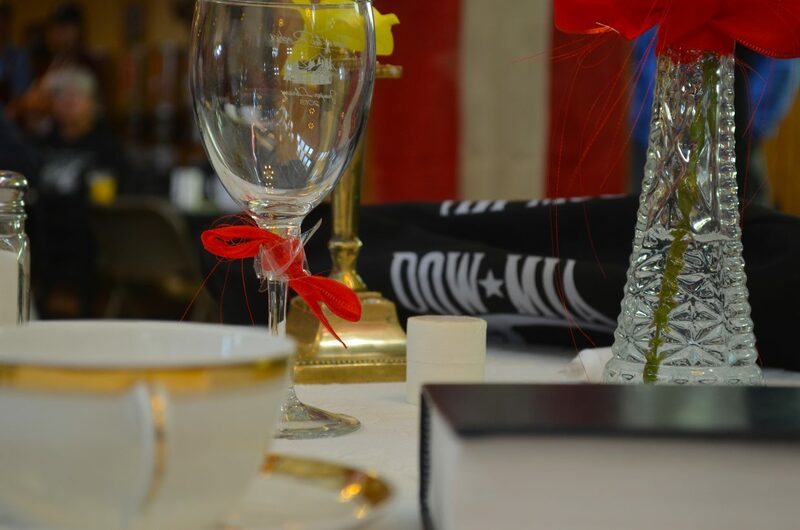 Symbolic table furnishings rest atop the “Missing Man Table” at this year’s Veterans Day ceremony for Grand County. 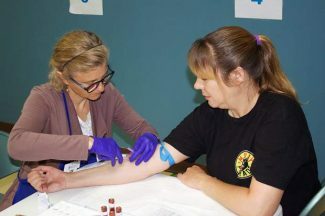 The Missing Man Table, and its accompanying ceremony, are regular features at Veterans Day events and honor those veterans who became prisoners of war or who have been designated as missing in action. 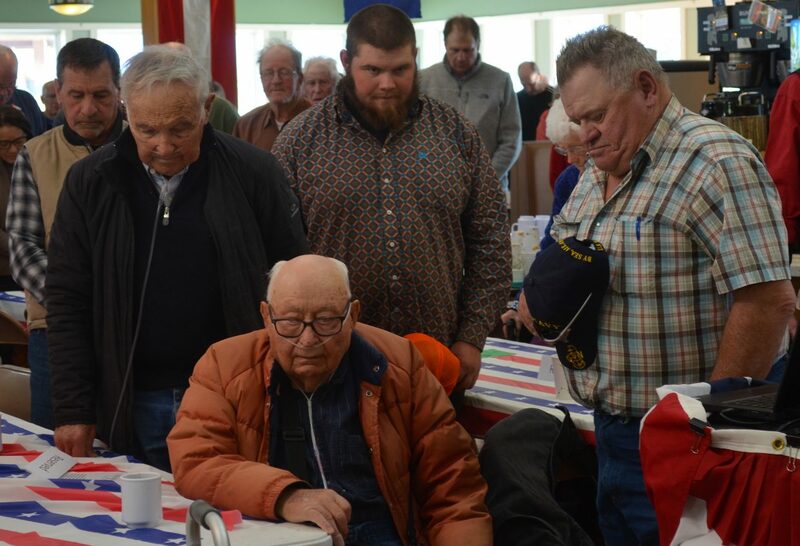 Veterans and attendees at this year’s Veterans Day event bow their heads during a moment of silence honoring the fallen. 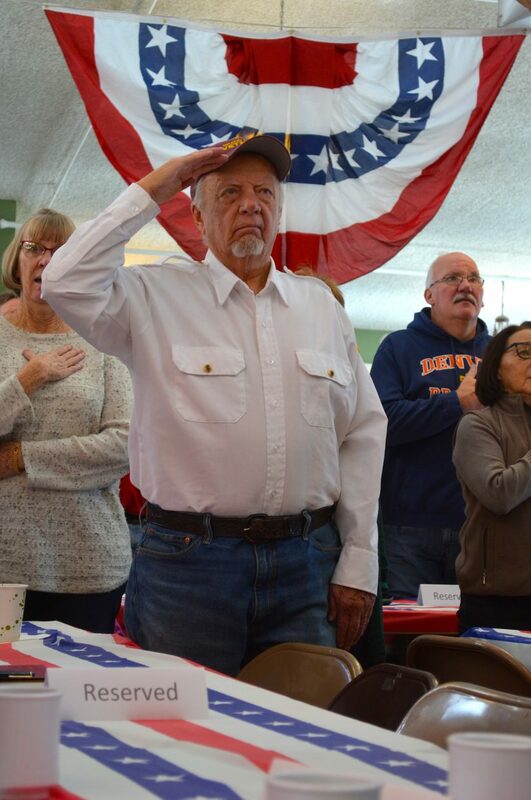 Rudy Perez salutes the flag during ceremonial proceedings Monday morning at Snow Mountain Ranch. 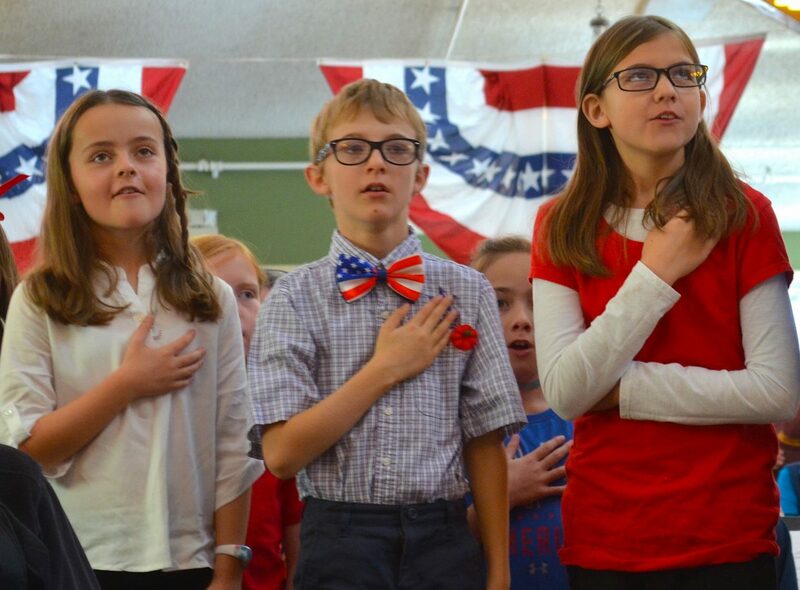 Local school kids, who sang for Grand County’s veterans Monday morning, recite the Pledge of Allegiance. 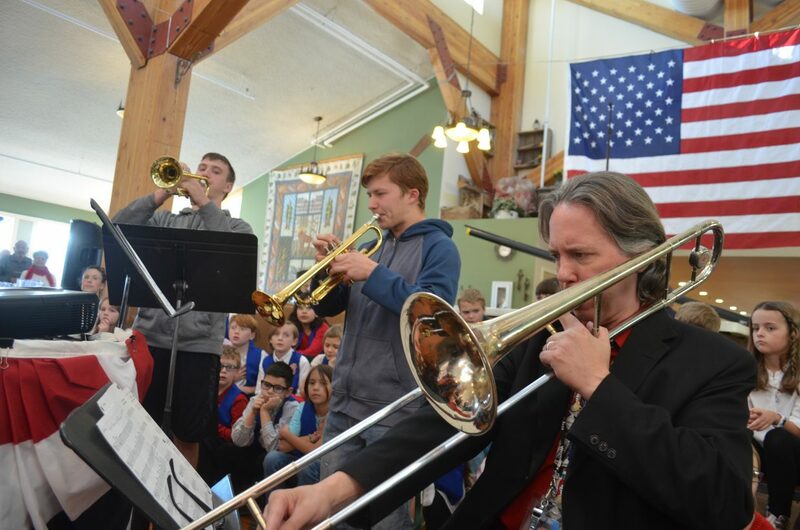 Middle Park High School Music Director Brad Pregeant (right) performs with several of his top students at the beginning of Grand County’s Veterans Day activities. 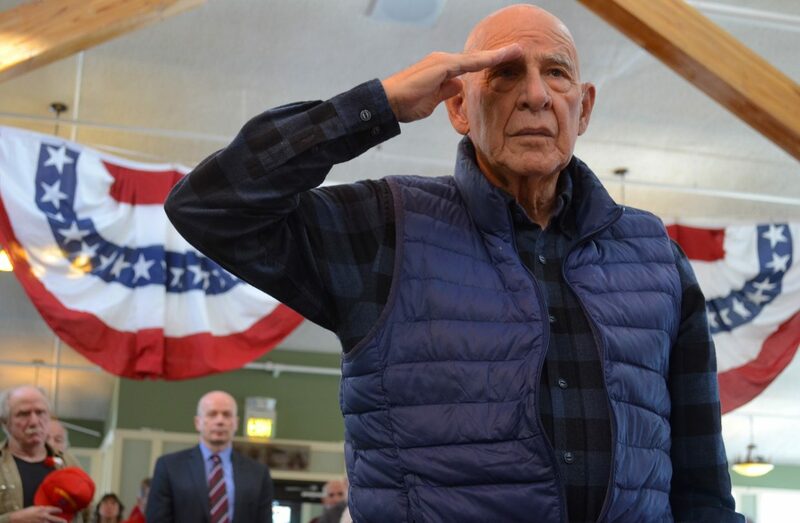 One of Grand County’s veterans salutes the flag during ceremonial proceedings at Monday’s Veterans Day event. 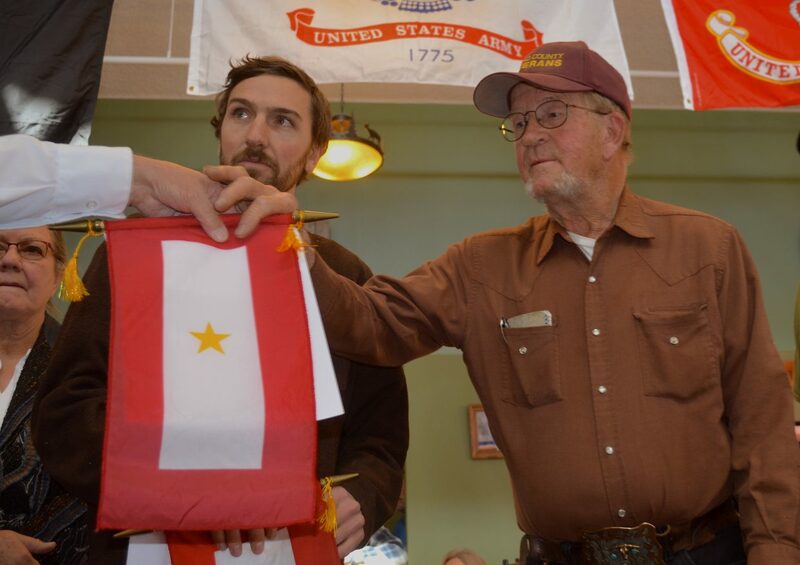 Kremmling area resident Jim Yust receives a gold star banner from American Legion Post 88 Commander Gerald Boyd during Monday’s ceremony honoring veterans. 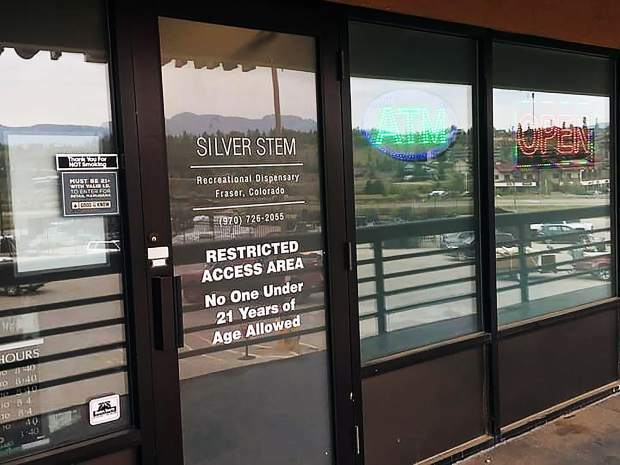 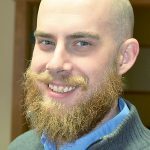 Yust and several other Grand County residents, who had family members serve in World War I, received special recognition Monday as the American Legion presented them with blue and gold star banners. 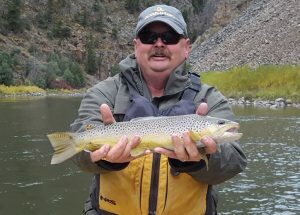 Yust received a gold star banner in honor of his relative, Carter Yust, who died of pneumonia while serving with the US military during World War I. 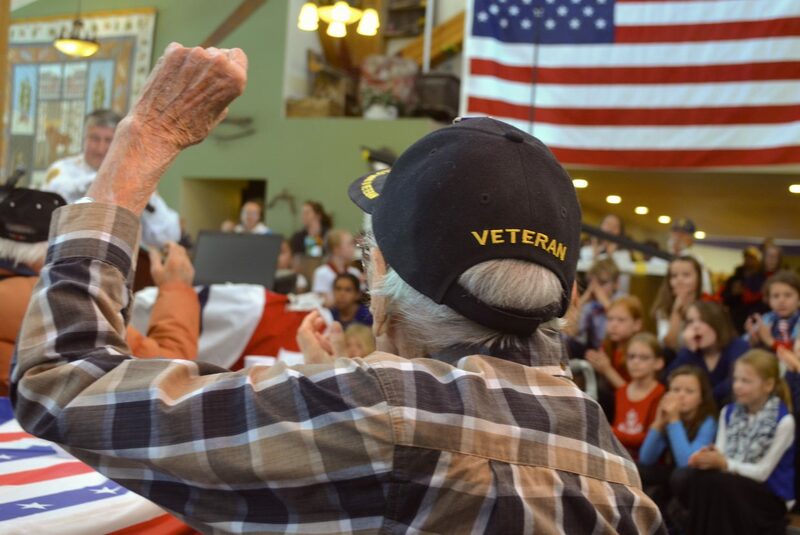 10)	JR Rauenbuehler, one of Grand County’s World War II veterans, raises his arm during the roll call portion of Monday’s Veterans Day event. 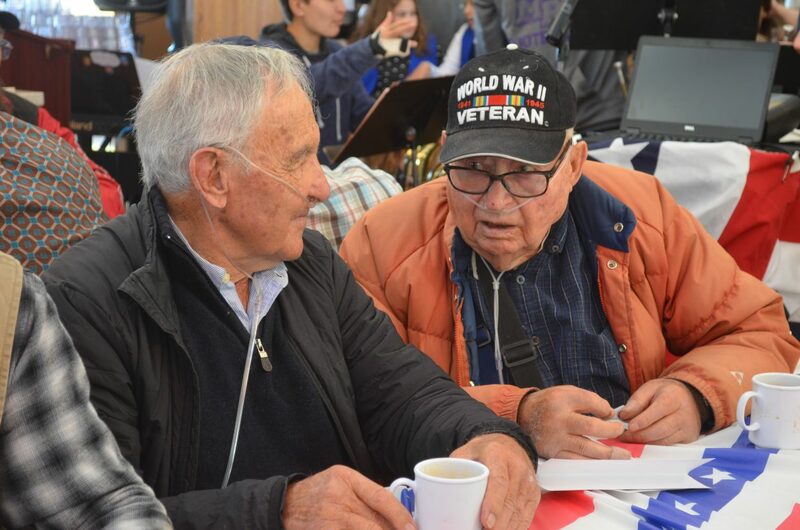 A pair of local veterans chat while awaiting the start of Monday morning’s proceedings at Snow Mountain Ranch. 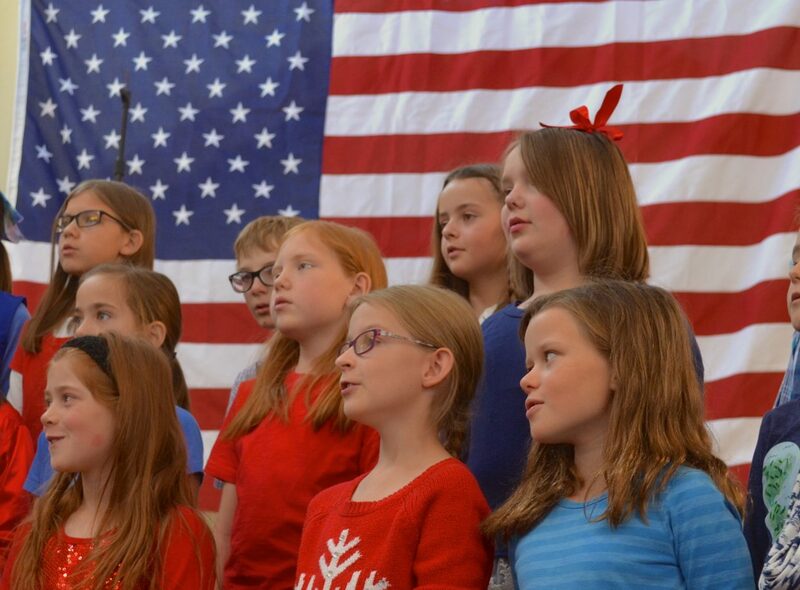 The Minne-singers, from Granby Elementary, sing patriotic and classic military songs to the veterans at Monday’s Veterans Day event at Snow Mountain Ranch. 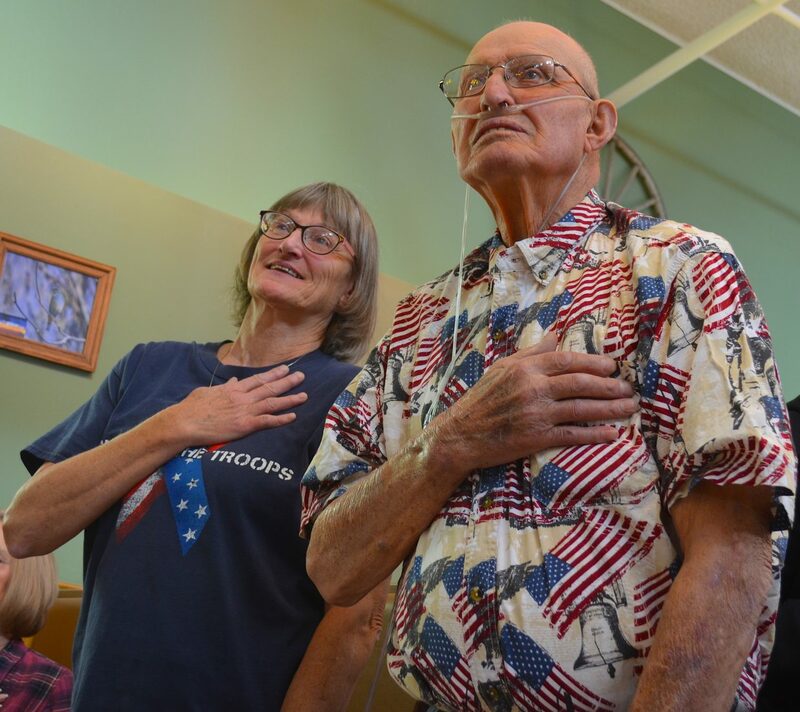 5)	Korean War era veteran Don Acord recites the Pledge of Allegiance alongside his daughter Polly Allison. 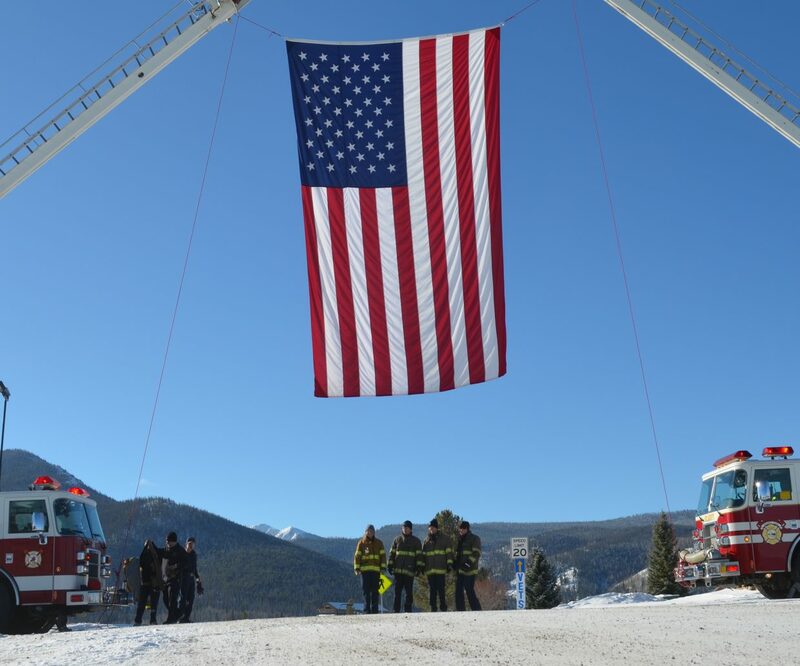 Local firefighters stand underneath a massive flag draped between two fire engines at the entrance to YMCA Snow Mountain Ranch where Monday’s Veterans Day ceremonies were held. 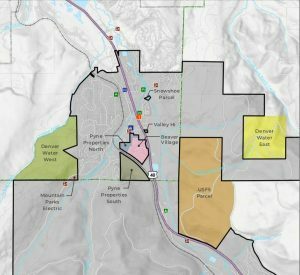 Local veterans, their family members and grateful citizens came together Monday morning at YMCA Snow Mountain Ranch south of Granby for Grand County’s annual Veterans Day event, honoring the service and sacrifices of local citizens who served in the US military.